Have you ever ventured into a local mom-and-pop restaurant for the first time? The experience can be pretty scary. And though you might not have thought about it, you probably have a systematic restaurant evaluation process every time your culinary cravings drive you to someplace new. If you’re like most people—even before you address the hostess or peek at the prices—you take a 10-second evaluation of the environment. And in most cases, that single 10-second assessment will determine whether you’ll stay or go. What if your first-time guests evaluate the church in the same way? In just a matter of seconds, visitors decide if they’re interested in feasting on what you’re presenting. Though well-designed environments can’t singlehandedly make your visitors stay indefinitely, a lousy design can absolutely repel your first-time guests. Here are seven design tips that will make your environments more appealing and help your visitors stick. 1. De-clutter the common space. One of the most notable bestsellers in recent years is the little book called The Life-Changing Magic of Tidying Up, by Marie Kondo. With over 10 million copies sold worldwide, even Netflix decided to launch a Tidying Up TV series that showcases Americans purging their junk. The American fascination with junk even seems to have infected the local church. Closets crammed with nappy puppet gear and VBS decorations from 1983 have robbed the church of expensive ministry square footage. It’s as if the church building is a supersized version of an office’s community refrigerator that never gets cleaned out because nobody wants to throw away somebody else’s stuff. Unfortunately, even if you’re clutter-blind, your guests will notice every superfluous or unnecessary item in your facility’s shared space. De-cluttering is the first and most inexpensive way to bring a fresh appeal to your environments. A quick and thorough purging will immediately freshen up your facility. 2. Control the critical mass. For example, a mostly empty lobby will result in a lack of energy that leaves guests feeling awkward and exposed. Yet, a lobby that’s crammed with a colossal crowd of people causes claustrophobia. If your common spaces are too big, shrink it with some pipe-and-drape or lighting zones or fill the empty space with high-top tables and furniture clusters. If your lobby or auditorium is too small, expand to outdoors, or create alternate worship venues across your campus (the hipster version of an overflow room). Some of the most significant contributors to crowding in specific areas are full-service coffee bars, coffee creamer stations, and children’s ministry check-in. So, disperse the crowding by using your multiple zones across your campus to check in and caffeinate your crew. 3. Spruce up the signage. Remember that last time you visited a furniture store and the hungry sales guy pounced like a predator hunting prey? The experience can be pretty suffocating for people who long to self-navigate the sofas. Empowering your guests to be equally independent will quickly help them feel more at home. One of the best ways to help visitors stick is to spruce up your signage. If you want to dig in a little more, check out my article that offers several tips for building navigation. When guests first arrive on your property, they show up with a low-grade anxiety of knowing they’re an “outsider.” First-timers often want to do everything they can to avoid drawing attention to their newness; they just want to blend in. As a result, it’s critical that your main entrance be undoubtedly clear from every space in your parking lot. It’s really the best way to begin your guest’s experience. Otherwise, you may feed their anxiousness. Simple changes can be made to highlight the main entrance and draw a visitor’s eye to where they should go. Add some outdoor patio furniture with big umbrellas. Play music from the main entrance. 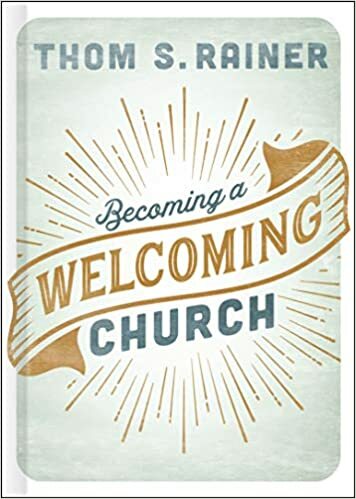 Construct a large welcome sign, put the name of the church on a portal or merely drop in a few feather banners. In the residential real estate world, realtors often say that the two most important rooms of the house are the kitchen and master bath. For the church, it’s the kid’s check-in and the women’s restroom. Those areas deserve significant design attention. If your restrooms are too small or have the same vibe as your grandma’s guest bath, it may be time to update. Replace those rusted stall partitions and add baby-changing stations (even in men’s restroom). And as an added bonus, make sure there’s a place for your members to set down a Bible, an iPad, a purse, or coffee. I’m not sure it can be overstated: Coffee is really, really important to your guest experience. Several years ago Yale University psychologists revealed study finding that show people judge others as more generous and caring when they held a warm cup of coffee and less likely if they had held a cold drink. Please don’t hear me recommending you invest in building and staffing a full-service coffee bar. In fact, many churches are abandoning that idea and leveraging space to create additional sitting areas for people to connect. Instead, merely serve some well-brewed drip coffee in coffee kiosks throughout your lobby. These days, guests (rightfully) expect your children’s ministry environments to have top-notch security. Kids’ classrooms riddled throughout public corridors and unsecured gathering spaces quickly generate a high-grade panic for your guests. If the building layout inhibits your kids’ security, recruit highly visible volunteers to be stationed at critical points of entry until you have the cash for a permanent security fix. There’s a lot at stake every week when guests walk through your doors. You’ve only got one shot to make the right impression. Get started now and don’t wait to make investments that help newcomers stick. Visioneering Studios grew out of the desire for the church to regain a leadership position in culture. Since its inception in 2002, Visioneering has grown into a national faith-based design-build firm offering its suite of services to churches, nonprofits, and commercial businesses alike. Great advise. We have been trying to help some of our lay leadership understand some of these principles, but are hitting a wall.